Copyright (c) 2014, Girish Dalvi, Ek Type. All rights reserved. 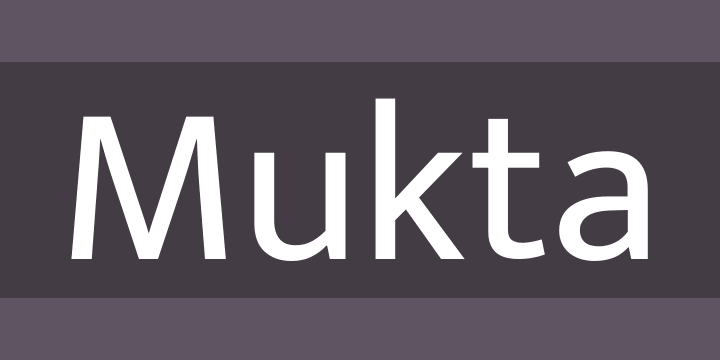 Mukta is a Unicode compliant, versatile, contemporary, humanist, mono-linear typeface available in seven weights, supporting Devanagari, Gujarati, Tamil and Latin scripts. This type family is a libre licensed version of Ek’s self-titled multi-script project, an ongoing effort to develop a unified type family for each Indian script. The goal is to build one harmonious family across all Indian scripts without letting the visual features of one script dominate over others. This ensures that the fonts can be used successfully for both single and multi-script purposes. This project is led by Ek Type, a collective of type designers based in Mumbai focused on designing contemporary Indian typefaces. At present, the project offers separate fonts with unique local names for each of the Indian Scripts. Each font supports one Indian script along with Latin.